Junior Nani Redford started in place of usual starter Sydney Skinner Saturday night. Harvard earned its second consecutive road split this weekend, falling to Columbia in disappointing fashion before outlasting Cornell the following night. Each game was defined by its first quarter. The Crimson was outscored 22-2 and shot 1-of-17 in a brutal opening stanza in Morningside Heights and then hit five threes in a dominant 25-13 opening period in Ithaca, N.Y.,. After a tough loss to Columbia, Harvard (11-8, 4-2 Ivy) knew it would have to come out strong against a scrappy Cornell (7-10, 1-5) team if it wanted to remain within shouting distance of Ivy League leading Penn. And it did just that, turning the Big Red over six times in the first quarter and jumping out to an early 13-2 lead before using its sizable height advantage to wear down Cornell late. 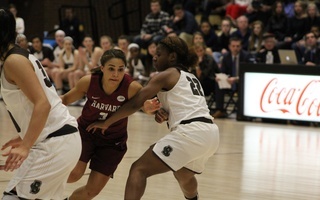 As she so often has this season, junior guard Katie Benzan set the tone for the Crimson early, scoring eight of her team-high 20 points in the first quarter and spearheading a tremendous passing quarter in which Harvard assisted on eight of its nine baskets. 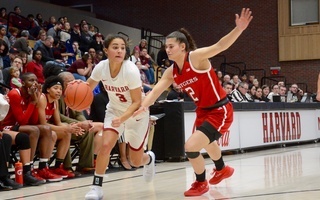 After its quick start, the Crimson struggled to maintain its ball movement and the free-flowing offense that spurred the first quarter production. Harvard managed just five total assists and 43 points in the last three quarters and lost all three quarters to the hometown Big Red. It appeared late in the game that — as it so often does — the nearly four hour bus ride from New York City had taken a toll on the Crimson. In the fourth quarter, Harvard shot just 3-of-14 and 1-of-8 from three point range. But the Crimson played well enough defensively to hold Cornell at arm’s length and led by at least eight points until just five seconds remained. 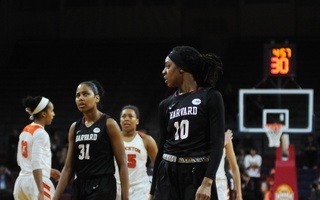 Three Harvard starters, sophomore forward Jadyn Bush, junior forward Jeannie Boehm, and Raster, fouled out Saturday. But none of the three was in much foul trouble until the fourth quarter, when the game was all but decided. They entered the fourth with three, two, and two fouls respectively, and all three played their normal allotment of minutes for the Crimson. Junior forward Laura Bagwell-Katalinich paced the Big Red with a career-high 25 points. Junior guard Samantha Widmann added 14 and was the only player in the game to play the full 40 minutes. Also notable Saturday was that head coach Kathy Delaney-Smith chose to shuffle Harvard’s starting lineup in the aftermath of the disappointing defeat at Columbia. 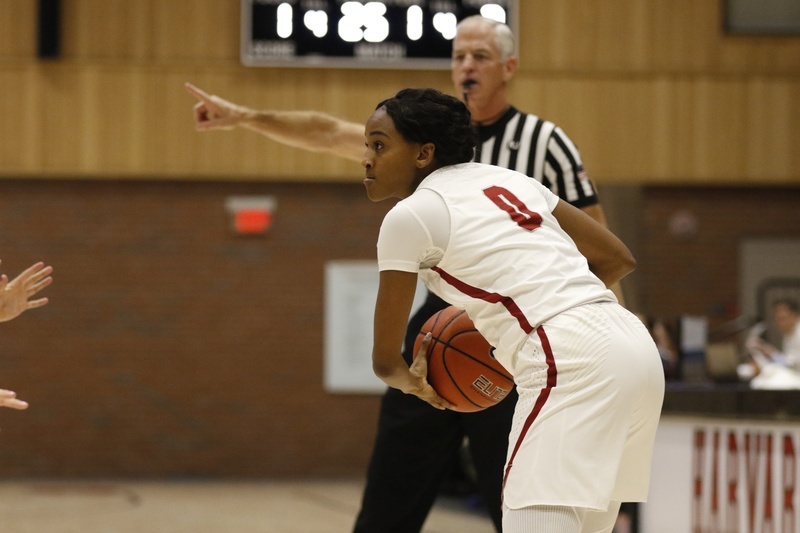 Senior guard Nani Redford, who had been one of the few bright spots for the Crimson on Friday, joined the lineup in place of co-captain Sydney Skinner, who played 15 minutes off the bench against Cornell. Very rarely does a team lose a game in which it is as dominant on the boards as Harvard was against Columbia (6-13, 2-4) on Friday. The Crimson gobbled up 27 offensive rebounds and held the Lions to just eight, allowing Harvard to take 35 more shots than its opponents. That is exactly what happened in Manhattan, though, as the Crimson fell behind early on and shot poorly enough (28%) to squander its rebounding dominance and the efforts of forwards Boehm and Bush, who both posted double-doubles and combined for 26 rebounds (16 of them offensive). The shooting struggles Friday night were pervasive. Benzan, normally such a reliable shooter, scored just three points, making it her worst performance since the bloodbath at then-No. 1 Notre Dame that opened Harvard’s season. She combined with Raster and Skinner to shoot 6-of-38 from the field. The Crimson’s problems went beyond poor shooting. Harvard also got crushed at the free throw line, where it earned just seven free throw attempts on the night, of which it made three. Columbia, meanwhile, finished 24-of-27 from the line and set the tone early by going 9-of-9 from the charity stripe in the first quarter. The Lions came into the weekend with three players averaging double-digit points per game. All three played very well against the Crimson, with sophomore guard Riley Casey leading the way with 23 points, freshman forward Sienna Durr contributing 22, and junior guard Janiya Clemmons adding 21. After three straight road weekends in which Harvard went 3-2, the Crimson will finally return to Cambridge next week for its crucial homestand against conference favorites Penn and Princeton. 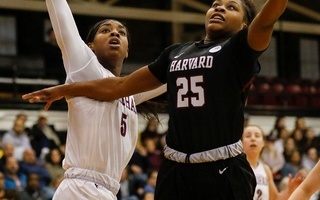 Harvard will look to extend its eight game home winning streak in Ivy League play, a streak that extends back to the beginning of last year’s conference season. The Crimson put in its worst quarter of the season to start the game, but rode a couple of hot hands in a scintillating second half to fray the nerves of the most optimistic of Tigers fans.